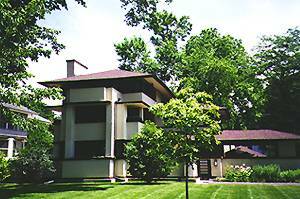 Wright built this house for William Martin, who was president of the Martin & martin Stove Polish Company in Chicago. The design of this house shows an indecisive Wright, apparently unable to make up his mind whether to build horizontally or vertically. (Compare to the Fricke House a block away.) The vertical stacking of interlocking rectangular masses and shapes makes a striking composition. Take a another look.